Today I am hosting an ebook reader help desk day. Throughout the day, I’ll answer, to the best of my ability, any digital book related question whether it involves setting up the cloud, converting ebooks, working with Calibre, and the like. Ask anything. If I can’t answer it, I’ll try to point you in the right direction. Please include your computer OS (Mac or PC), your device (if any), any software you are using, and the source of your problem. Ooo I have one. It’s been driving me nuts in the past few weeks. After I loaded all my ebooks to Kindle, I noticed that metadata such as titles and author names were messed up. Some show up as “null” or something like “Silver235123512” for the author and/or title. I fixed them all using Calibre and side loaded them to Kindle, using the cable that came with it. But the titles & authors have not been corrected. Do you know how I can fix this problem? Thanks! I’m a little confused by the Kindle 8/HTML5 announcements. Does that mean the Kindle will support ePub soon, or is it just about “enhancing” Kindle ebooks with illustrations/tables/etc for the Fire? Jane: I bought a Nook and am trying to sideload all my Smashwords books onto it. Adobe Digital Editions is giving me fits; it sees the Nook, but I can’t figure out how to get a book that’s been downloaded into reading view saved onto it. There seems to be no option to save from Reading view and if I move into Library view, the book vanishes and I have to redownload! For Calibre problems, your best bet is the MobileReads Calibre forum. The answer may get fairly technical, though. @Nadia Lee If you fixed the metadata after you converted and not before, the updated metadata isn’t embedded in the book file. You will have to re convert to embed the changes to the metadata. @Shannon Stacey No, I don’t think that Kindle will be supporting epub soon. at best, Amazon might allow you to send an epub which it would then convert, but I doubt it will ever support epub natively. I believe the move to Kindle 8, html5 based, is a move to support a more robust ebook but also to streamline its content. The Kindle Cloud Reader, for example, is an html5 app. Then connect your nook to your computer. A window will open which will allow you to select books in your PC app folder and send them to your nook. I add all my third party books to my nook this way. That way the two stay in sync, though I don’t read from the PC much since I got the nook. I imagine this would probably work with the nook mobile apps as well. Because I have the PC app set to automatically download new purchases from B&N when I open it, I always have all my B&N books on my hard drive. In Windows 7, the files are saved in My Documents in My B&N ebooks folder. There’s a sub-folder titled with my B&N account name that contains all B&N purchased books, and all books sideloaded into the app are in the main folder. It makes it easy to keep my books backed up, because everything’s in one place. Question 1: is there anyway to organize the books into collections (such as you can do directly on the Kindle) for the kindle library that you can access online through Amazon? I have about 1700 books and it’d be easier to manage if I can categorize them. However ,I can’t seem to figure it out and the kindle library defaults to by author or by title view and with this many books it’s hard to manage. Also, do you know if the Kindle Fire will retain the collections like the regular Kindle or will we have to recreate them when downloading books? Question 2: Whenever Amazon sends me an updated/revised version of an e-book I have, it hangs out on my main screen and will not default back into the collection I’ve assigned. I’ve had to reset my kindle in order to get rid of them and half the time, that doesn’t work. And since I have so many books on my kindle, it takes forever to reload. Q1, Kindle Collections: Unfortunately collections is a huge problem with the existing Kindle devices. You can’t access them online through Amazon but you can create collections on your harddrive using the Kindle for PC/Kindle for Mac Software. I’ve done a short tutorial here. Once the collection is created on your harddrive, you can then import those collections onto your device. However, the books must be downloaded to your device in order for them to show up in your collections. My understanding is that collections will be part of the whispersync in the future such that collections, like personal documents, will be synched across all platforms, but that is not a feature that has been rolled out yet. Q2, Updated Books: Updated books from Amazon are actually treated like a new book file so it needs to be re-assigned to the collection. @Jane: You are THE BEST. Thank you! I was afraid I’d have to return it and keep reading on my iPod, which I hate doing so much, I actively avoid reading on it. @erinf1 – If you use Calibre, there’s a Kindle Collections plugin available over at the Calibre forum at MobileReads that works like a charm. I have a question too. I recently uploaded my WIP to my Kindle 3 by using Calibre to convert a Microsoft Word RTF format document to mobi. Then I sent the document to my Kindle through Calibre. But when I read through the document on the Kindle, a paragraph that had been in the RTF document on my computer is now missing. Is there anything that can be done about that? @Janine: My guess is you have wonky formatting in your Word / RTF document. Go to the paragraph in your RTF that is missing in the Mobi and highlight it and select “normal” as the formatting. Try again. I have a Nook 1st edition 3G. I have ongoing problems if I try to sideload any significant number of books. It just hangs. I can usually get somewhere up to 200 on. I’ve tried with the original .pdb books I bought from Fictionwise. It will recognize them and deal with them in the DRM form but again it hangs. I’ve tried stripping the DRM and converting to EPUB. Still hangs. It also will show stuff that is no longer there. B&N can’t seem to wrap its mind around the fact that I’d like to load 1500 or 2000 books – I’ve got the room on SD card. Thanks for the answer on HTML5. I just thought of another question. I just saw a tweet about Robyn Carr’s new Virgin River holiday story and pulled up Calibre to see how far behind I am in that series. I have like 6 of the books in there, but they’re PDB format. I think I must have gotten them from FW during a sale. With Stanza dead, how would I get those onto my iPhone? Is there an app that accesses a FW bookshelf? @romsfuulynn: Sounds like one of the files you sideload is corrupt. If there is a corrupt file in the My Document folder the N1E cannot index that folder correctly. I have a big problem with Adobe Digital Editions. On the recommendation of the Adobe help(less) desk, I upgraded their program to allow access to my e-books on more than one machine. Mistake, big, big mistake. Now it does not recognize my desktop version of the program and newly purchased books won’t open on my e-reader, either. I made 3 attempts to get the Adobe help(less) desk to fix this mess with no joy. Then I tried to use Calibre to strip the DRM after the fact, but as I understand it, you have to be able to open your books in Adobe Digital Editions first to make the magic work. So, again, no joy. I’m using a Mac with OS X 10.6.8. and a first generation iPod Touch as a reader. Can you think of any work around or am I totally out of luck? @Marina Smith My guess is that you have created a new authorization sign in name. If you can open ebooks on one of your machines, then go to Adobe Digital Editions on that machine and in “library view” select “library” and then “Authorize Computer”. That should bring up a screen that says “This computer has been authorized to” and then it will list your Adobe ID. That is the Adobe ID you should use in each one of your ADE installations. If you do not have a machine that reads any of your ADE books and you aren’t sure what your Adobe IDs are, you may need to contact Adobe here. One of the problems is that books downloaded under an old and forgotten Adobe ID are not recoverable. You will need to redownload those. Let me know if that helps or you need further assistance. @Shannon Stacey If you still have the ereader app on your Ithing, it works under iOS5 but you can’t access the app in the App store. It has been pulled. Otherwise, I would do a mass download and import those books into Calibre and convert. I have a Mac, a Kindle 3 and Calibre. The one thing I miss the most about paper books is being able to browse through my collection and read the “back cover” information. I haven’t found a good way to do this on the Kindle – the “Book Description” link just takes you to Amazon (which requires an internet connection) and the information there is often missing or incorrect. I have ended up making my own database of covers and book descriptions (on my Mac) – so I can browse, but I feel like there must be a better way. I know this is a feature that has been requested on Kindle, but am I missing something? If I had a Fire or iThing, would this be easier? @Jane: I had deleted the eReader app because it sucked. But I found out the handy-dandy Adobe DRM gadget also works for PBD. Not quite as slick, but it worked well enough to get it into ePub and onto my iPhone. Thanks! @Karen: I don’t know of any good way to get a book description on the Kindle devices or the apps. @Jane: Thanks! It took me forever to figure out how the formatting was different in that section and how to change it to match the rest of the document, but I did and now I can read it on the Kindle. The reason I was so stuck on the Collections is that my Kindle froze up and I got a replacement one and had to re-download all of my books and since the collections didnt come too, I had to remake those and reassign, which took *forever*. Then whenever I have to reset, sometimes the collections don’t come across. I’ve tried unregisteribg, re-registering. The whole 9 yards. Just gave in and did it all over again. Also, the revised editions – I have reassigned them to my collections and they are still on my main screen. It’s like there’s a glitch and the Kindle doesn’t recognize that they are assigned. Siiiiigh. I’m really, really thinking of upgrading to Kindle Fire and selling back the Kindle 3. Seems like it would be easier to use. But I’m a little leery of all the other functions and how they impact the actual e-reader part. That would be the main function for me. I really like the Kindle, it’s just that sometimes troubleshooting is hard to do when you aren’t tech savvy. I troll the Kindle forums all the time on Amazon and get answers about 50% of the time. @erinf1: Keep in mind Kindle Fire is a regular screen not an e-ink screen. @erinf1: It is hard to know how collections will work with the Fire. Currently there are no collections on the Kindle apps even though the touchscreen devices, like the Kindle Fire, would allow easier maneuverability of files. Right now your best bet is either using the Kindle for PC/Mac or the Kindle plugin. Perhaps that is a “how to” I could write for next week. Overall, I have to say I do like the Kindle so much more than I thought I would. But just like any tech, it’s wonderful while it works and terrible when it doesn’t. Have a fantastic day! @Karen: That annoys me greatly too. What I’ve done is to put the backcover blurb (pulled from Goodreads or somewhere similar) into the Comments field in Calibre and add the cover I want in Calibre. Then when you run the conversion, on the Structure Detection page, there’s a tick box labelled “Insert Metadata as page at start of book”. I transfer the converted book to my Kindle and it has the metadata, including the cover and blurb at the front of the book. Of course, for Kindle books themselves, if I do this I lose the syncing ability etc, so I’m stuck with using the Amazon Book Description link for those. But it works for the books I buy elsewhere and convert and that’s the majority of my library. I hope I’ve explained that clearly. If I haven’t, ask me to clarify. @Janine (#15) – save the Word document as filtered web rather than RTF. You get a better result that way. Unless I am misunderstanding what you are looking for, the blurb can be incorporated into Calibre in the metadata. In edit metadata individually the metadata can be downloaded automatically, or any notes you want can be cut and pasted into the comments area of the metadata page. Covers are downloaded here too. If you convert your book prior to uploading to your device, even if it is already in the format you want (eg convert epub to epub) the book on the device should incorporate the blurb. In Calibre you can see both blurb and cover each time you highlight abook title in your library. @RachelT: But the blurb isn’t data that can be easily read on the Kindle device. It’s not like the Kobo where the book description can be accessed with a tap at the top of the screen. The Kindle Book Description link takes you to the Kindle store and relies on the information at the Amazon site and is accessible only when you are hooked to the internet if you have wifi Kindle. Thanks for all the great info, everyone. The ebook reader help desk day was a good idea, Jane. My question re: my previously purchased FW books (now in ereader, not MSReader) was answered. i didn’t know the actual format name on the Calibre website when I looked earlier. Currently reading ipad apps Kindle and Kobo. My ebookwise is gathering dust. Sorry I’m late, but there is still one question (maybe you can answer it the next time). I’m reading my ebooks on my Samsung Galaxy Tablet, but it’s only possible to read certain formats, like pdf or epub. I already tried different apps for reading DRM-protected books, like txtr or Aldiko Premium, but even with having the Adobe ID there is no possibility to read them. Maybe you have a solution. @Evelyn: IMO the best apps for reading DRM’d ePub & PDF’s on Android would be Mantano and Aldiko. Make sure the Adobe ID you use for Adobe Digital Editions on your computer is the same ID you use for your reading app on the Galaxy. Is it DRM’d ePub’s or PDF’s you’re trying to read or some other format like Mobi or eReader? Do you get error messages when trying to open a DRM’d book? There are a few ways to add DRM’d ePub/PDF to Aldiko. If your Aldiko has your Adobe ID registered it should show up in ADE (either with a device name or with the name Aldiko Premium) when your tablet is connected as a mass storage device via USB. 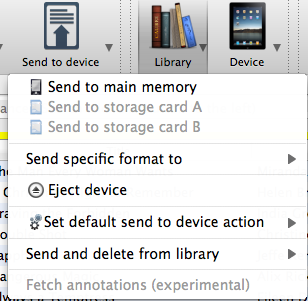 You can then drag the books you want onto your device through ADE. You can also copy the book to the Digital Editions folder on your device and Aldiko should find it. You can copy the .acsm file provided by the retailer/library you got the book from and use a file manager to open the file. It should download directly into Aldiko. @Becca: Thanks, I will try that in the future. Awwww…I’m so sorry I missed this!! I hope you do something like this again in the future, Jane!! Thanks for taking the time and continuing to keep us updated on the latest and greatest. @Brian: thanks for the help, I’ll try your suggestions. @Kerry D.: I tried the “Insert Metadata as page at start of book” option and it worked great on the book I tried it with. I have a Sony 505 so syncing with Amazon isn’t an issue.